As promised in my 25 things before 25 this is my Sunday bake for this week. 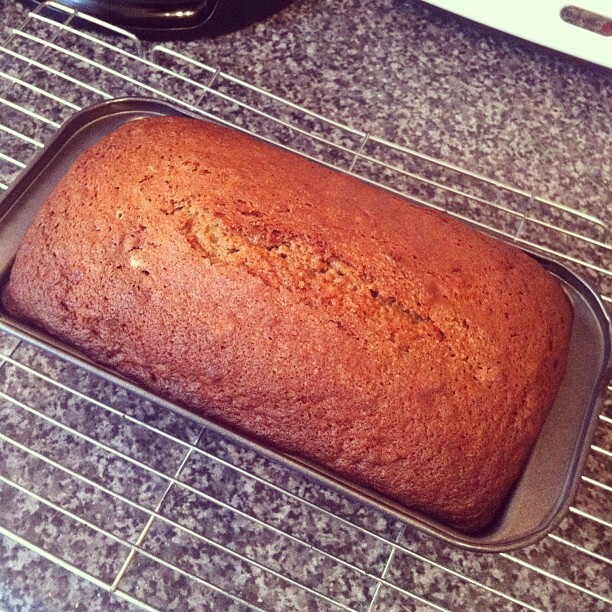 A simple yet delicious Banana Loaf! I have done this recipe 3 or 4 times now and it never gets old so I am sharing it with you. I tend to make this loaf when I have too many bananas left and they’re starting to turn brown. They mash really easily and the taste is more sweet and intense so they are perfect for baking. Instead of a banana loaf you could make banana muffins, just pop them into individual cases before baking for a shorter time than suggested. 1) Pre-heat oven to 170C/325F/Gas Mark 3. 2) Grease and lightly dust flour into the loaf tin and set aside. 3) Pop the sugar and eggs into a bowl and beat until well combined then beat in the mashed bananas. 4) Add the flour, bicarbonate of soda, baking powder and cinnamon to the combined sugar mixture. Mix thoroughly until it is well incorporated and no dry mixture remains. Pour the melted butter into the mixture and beat until all the ingredients are well mixed. 5) Pour the mixture into the prepared loaf tin and smooth over to make level. 6) Pop it into the middle of a preheated oven for approximately 1 hour or until firm to the touch and a skewer inserted in the center comes out clean. Leave too cool slightly before turning it out onto a wire cooling rack to cool completely. I tend to have a slice before it has cooled, I just can’t resist the gorgeous smell and sight of it! If you want it to look a little more fancier you could even top this off with a cream cheese frosting. It should last for 2-3 days in an air-tight container!